Do you know what your family tartan is? Or your family crest? Both would be great to use. My son-in-laws family crest has a blue & yellow pinwheel in the center. I was thinking of making him a quilt with that design. Something with a scottish thistle would be very traditional. Google images of scottish quilts. You will get loads of ideas. Maybe a scrappy quilt with all plaids? Speaking of Scottish, I have just finished watching all the series of Monarch of the Glen and now I am interested in Scottish history and traditions. There were a few quilts shown in the shows, mostly traditional pieced patterns. Wonderful family show! Last edited by BellaBoo; 07-17-2013 at 07:00 AM. Here is another link I just found, quilt inspired by floor tiles from St. Andrews Cathedral in Inverness. This is a beauty! Unfortunately the directions don't include a pattern for the applique but you may be able to duplicate it on your own by downloading the photo and enlarging it. This only makes a 40" wall hanging. You could probably enlarge it with borders or a round of blocks to enlarge it. There is a Scottish member living in the granite city , Aberdeen. Think her name is something like Kinnette? I know there is a pattern available which positions the fabric colors to make the entire quilt look like plaid. Maybe he'd like that. Maybe you can do it in the family colors. There are several pieced and appliqué patterns for Scotty dogs. 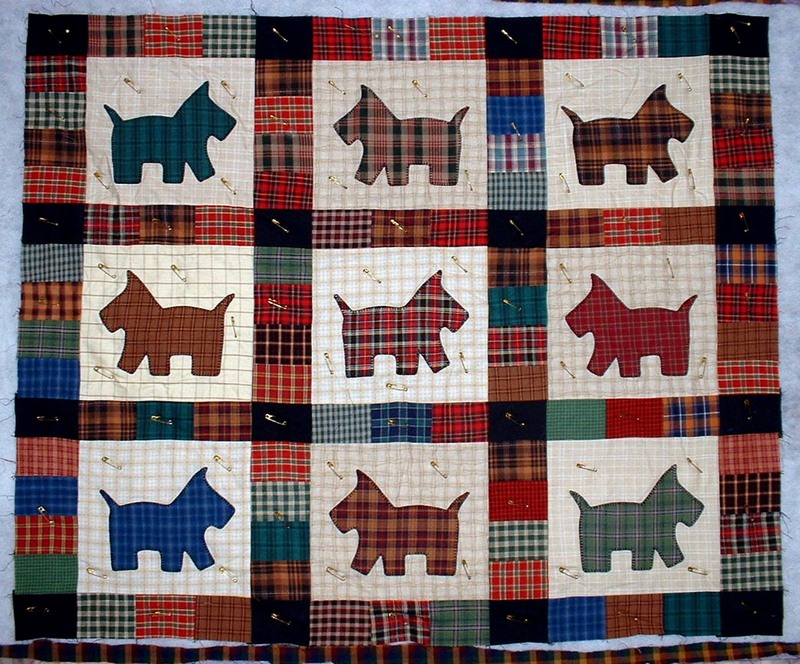 A quilt made of Scotty dogs with tartan bows would be cute. There some plaid or woven patterns at quilters cache - quilt blocks galore. I found a few links for you. Hope they help! http://pinterest.com/hot4art/scottish-celtic-quilts/ - Scottish/celtic blocks. Mostly different variations of the Celtic knot, along with a few others. It will be interesting to see which one she chooses ... and look forward to seeing it. I can't remember if I found this pattern in a really old quilt magazine. I made it for the Westie Rescue and it brought in a lot of money from the bidding. I remember that the background was rectangles because of course Scotties and Westies are a little bit on the long side. If you need any additional info, just PM me. Good Luck !! Greetings from a hot and sunny Scotland! I'm afraid to say that there's no 'classic' Scottish quilt pattern that I'm aware of. You've had the usual suggestions of Celtic cross (many are actually Irish) and thistle. The Scottish flag - a St. Andrew's Cross - is a simple design in blue and white. There's also the Lion Rampart in that link, but a bit more complicated, lol. The most obvious would be something with Royal Stewart tartan - that's the red one you see most of. It's the official tartan of the Queen and therefore may be worn by any of her subjects, lol. The selection of cotton tartan is limited - most tartan fabric is usually a poly cotton mix. A lot of what you call 'plaid' (a plaid is actually a blanket- type garment worn over the shoulder) isn't actually tartan but actually just check fabric. I'm not sure if this novelty fabric is to your taste - it's made by Nutex (a New Zealand company - go figure!). Over here it would cost you $15-$18US a metre (39"). Last year I did make a double wedding ring quilt for a wedding nglish and Scottish combo. This picture is only a ninth of quilt centre was a thistle and rose inan oval took no photos of that on iPad. Use tartan or plaid material perhaps? When it comes time to finish your quilt, www.quiltingstencils.com has thistle stencils in various sizes for free motion quilting. I use these with Golden Threads tracing paper. I totally agree with Knitette, my origins are from the granite city, Edinburgh but I now live in North Wales. The Celtic knot I have always believed to be more of Irish and Welsh inorigin but have not found a truly Scottish based design as their claim to fame is their beloved Kilts, although they seem to favour the wholecloth method http://books.google.co.uk/books?id=B...origin&f=false for quilts. I have made a number of quilts for my Brother in Scotland and he loved all of them but the only one that had a truly Scottish touch was one that I backed with a lovely piece of wool which had a miniature plaid design on it, similar to the Stuart tartan. I think this link https://www.google.com/search?hl=en&...cp.r_qf.&cad=b gives some of the best suggestions IMO. Do let us know how you get on pretty please. Hi from a Scots quilter. 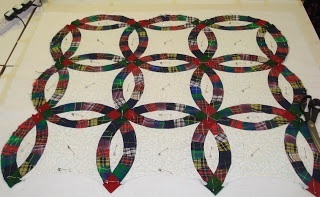 There is a Scottish Cross pattern that can be gotten from the "all quilt patterns" web site. Any pattern that has a mountain or sea design would fit just fine. Also any clan tartan in nine patch squares or the Scottish flag design would be a nice touch. Don't know what happened. I posted SEVERAL links but none showed up. 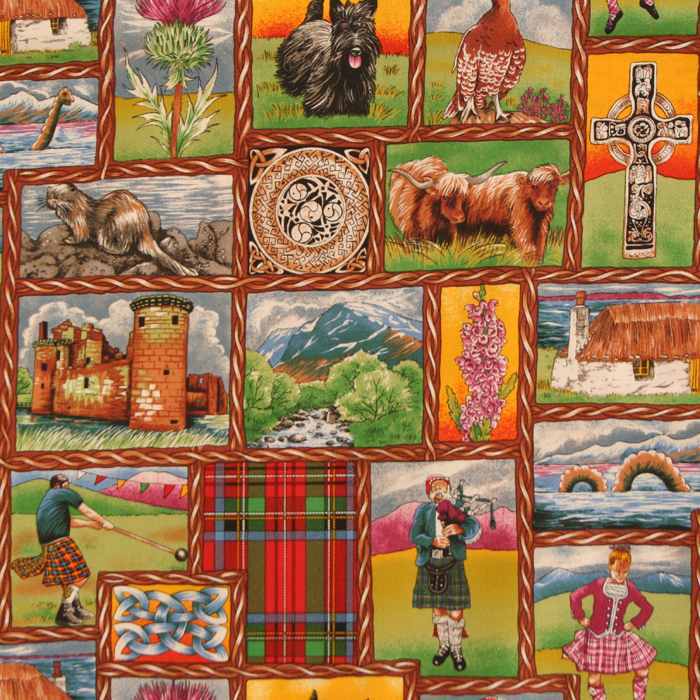 I just Googled "Scottish design quilt" and there are LOTS of links. I'm sure you'd like one or all of them. Georgia Bonesteel did a Scottish Thistle in plaid that was pretty. In her "More Lap Quilting" book,I believe. I would think any thing with tartan plaids and a version of the thistle would be Scottish. I know that I found a paper pieced celtic knot on quilters cache at one time. Or quilted celtic knots in corner stones, perhaps?